Read the full description below for details of everything included. 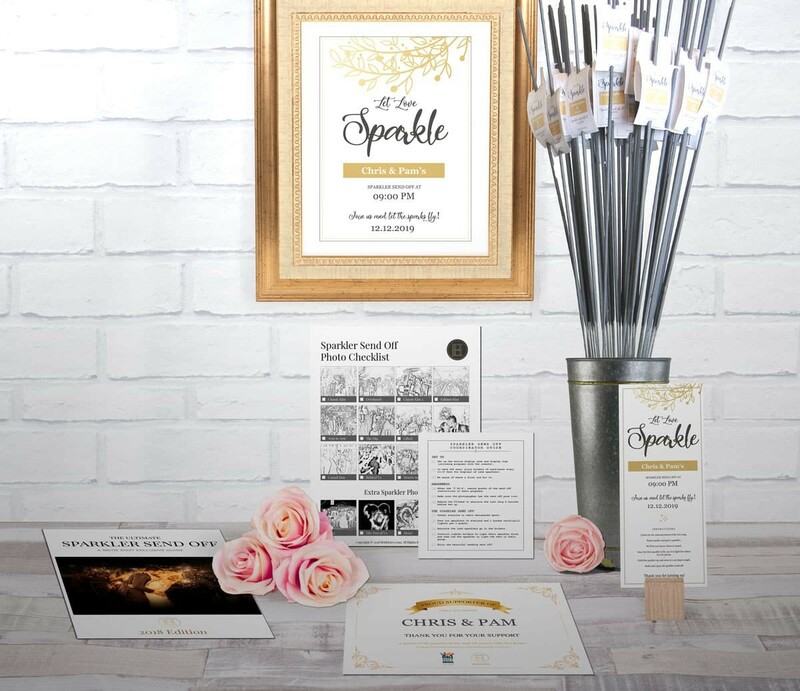 A Sparkler Send Off Display Kit from Bride Envy provides everything you need for an elegant, custom, send off display. Sparkler Send Off Sign: 8 x 10 custom sign. It just needs a frame! The Ultimate Sparkler Send Off Guide: Twenty-six pages of detailed instructions to ensure that your send off is flawless. What kind of paper is everything printed on? We use ultra-high quality 70lb. Brilliant White paper with a Linen Finish. How should I handle the PDF digital download files? If you choose the PDF digital download option, you’ll receive all of your customized sendoff files immediately after checkout. Everything prints on standard 8.5 x 11 inch paper. The tags print 10 per page, the guest instructions print 3 per page, and the coordinator instructions print 4 per page. For cutting, we suggest using a paper cutter or trimmer for best results, but regular scissors work, too! What is the Girl's Not Brides Certificate? A portion of our profits goes to “Girls Not Brides,” a charity that seeks to end forced, child marriages around the world. You can help raise awareness by displaying the certificate at your send off display.